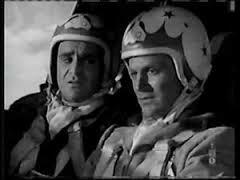 Do you older folks remember the TV show called “Jet Jackson, Flying Commando”? I grew up in Yakima, WA, and the show aired on our KIMA TV circa 1956-1958. It told the story of a World War II veteran who, along with his sidekick, Ichabod Mudd, fought evil-doers all around the world. The show was originally entitled the “Captain Midnight” show; but when it went into reruns, which we saw in Yakima, it was renamed. The jet which was featured in the series was the Douglas Skyrocket, named the Silver Dart. I met “Jet Jackson” when I was about eight years old. 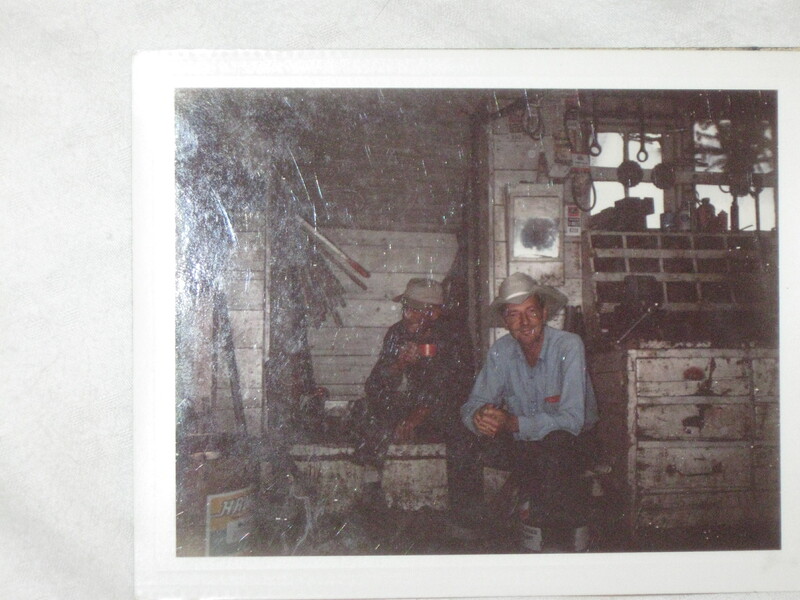 My Dad, radio/TV personality Al “Cowboy Pinkeye” Bowles, was either still employed at KIMA, or he had contacts, and he scored my brother Al III and me an invite to a “meet and greet” at KIMA with Jet Jackson, who was actually the actor, Richard Webb. He shook my hand, and gave me an autographed photo, which I’m sorry to say I tossed years ago, not being a collector, at the time. — I certainly know better now! I save everything! It wasn’t until recently that I learned the Jet Jackson show was actually the old Captain Midnight show. Due to legal issues, the program had to change its name. The producers (poorly) dubbed in dialogue in order to change “Captain Midnight” to “Jet”. I was just a kid when I watched, so I didn’t notice how badly it was done. I remember Mr. Webb, the actor, being very tall and handsome — a very nice, patient gentleman. I was one of many children who met him that evening at the television station. 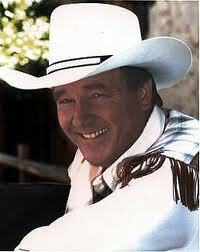 We inquired about his funny sidekick, “Ikky” Mudd, who was played by Sid Melton. He said Ikky was doing fine. It turns out the two actors were good friends in real life. 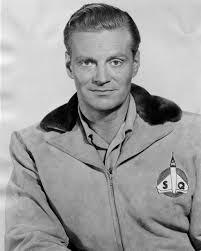 My brother and I loved watching this early adventure-almost-sci-fy show for several years, and always talked about how much fun it was to meet its star, Richard Webb. He was eventually awarded a star on the Hollywood Walk of Fame. So: do you remember Jet Jackson? 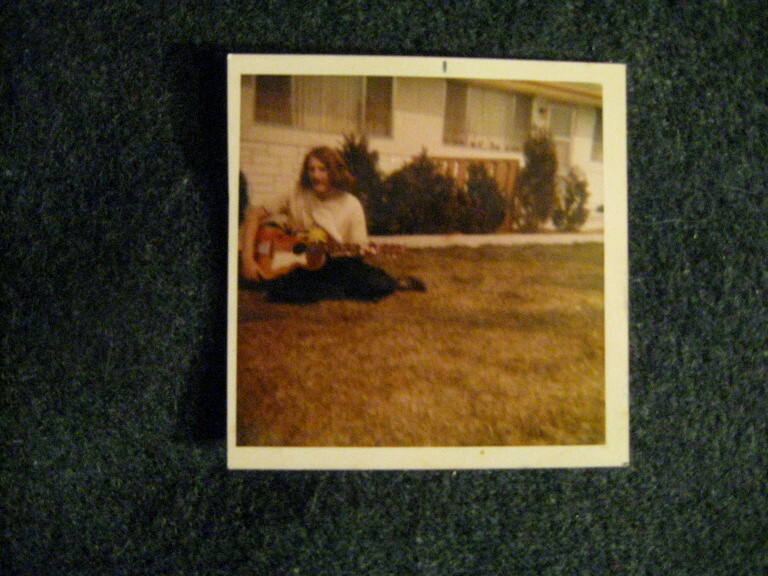 Your author in 1969, sitting on the front lawn on 40th Avenue, in Yakima. Oh, the stuff I threw away! Posters, magazines, record albums, love beads, incense burners, pipes, comics. My black light! I could go on. Yes, I could. 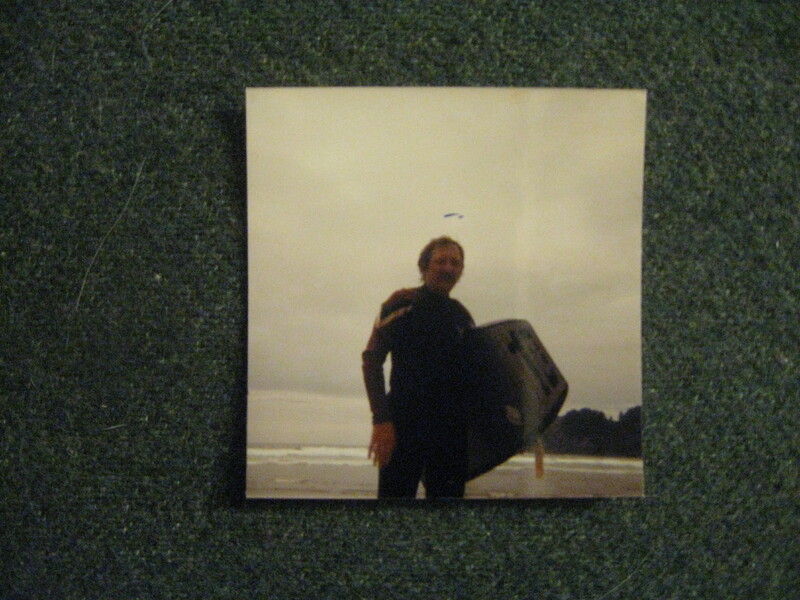 Most of the trappings of my late 1960’s/early 70’s, Yakima, Washington hippie boy lifestyle landed in the trash heap decades ago. 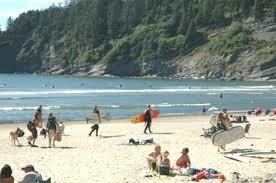 Perhaps I did sell a few things; but I received pocket change for them, compared to what I would rake in now. I did, however, save a few iconic treasures. 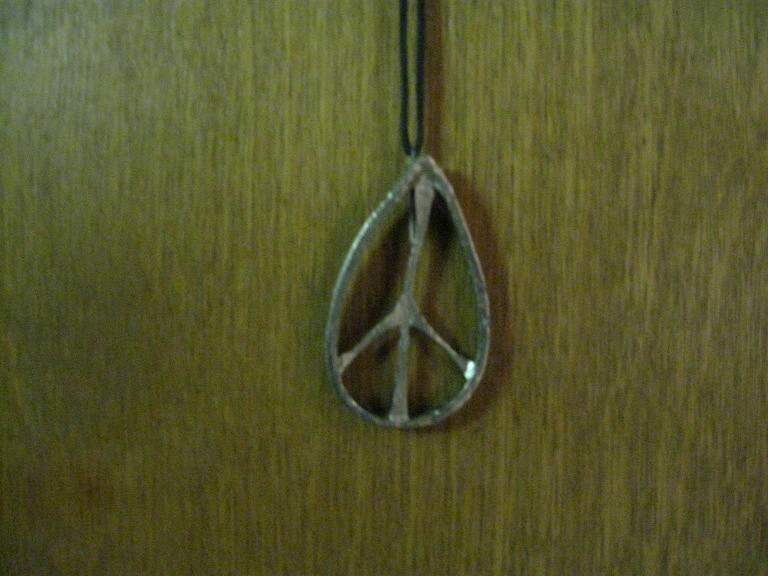 I suppose my peace symbol should come first. After all, that was the basis of the whole hippie thing, at least for me: peace. I’ve owned this since 1968-’69. Sorry I can’t remember the exact year I purchased it at a store in Yakima. 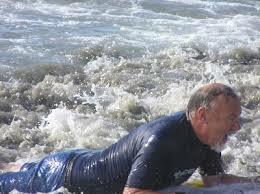 But actually, I remember quite a bit about those times, considering…. The pendant is made of cheap, cast metal; but, it’s seemingly indestructible. These days, I wear it when I play all-ages, folk-rock concerts. I’m sort of a “rent-a-hippie” performer. I provide the young folk with a chance to see a real live hippie relic, while I serenade them with the songs of Dylan and Donovan. 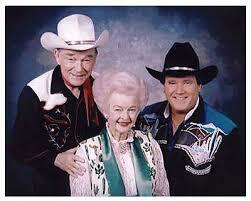 And, I help bring back memories of those great times, for folks of my generation. 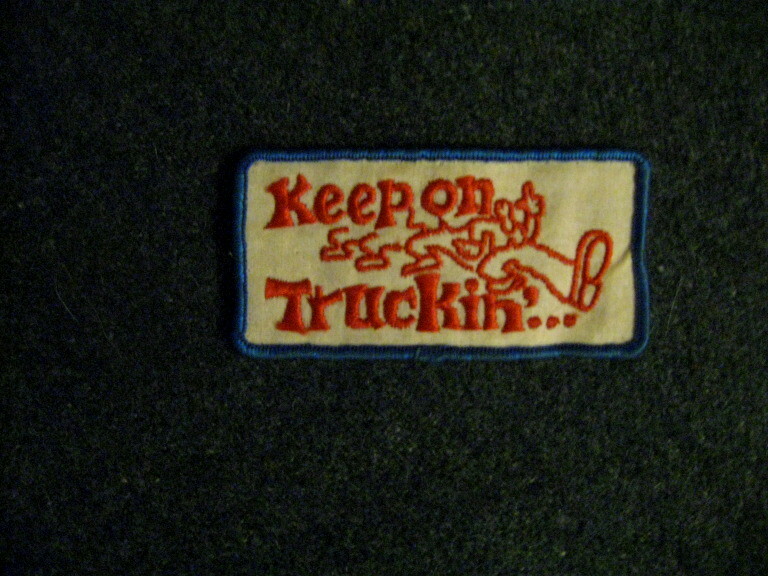 Here is a real Keep On Truckin’ patch, vintage 1969. No reproduction, this fine item! The patch far outlasted the pair of 501’s my Mom sewed it onto, by hand, for me. (Thanks, Mom.) 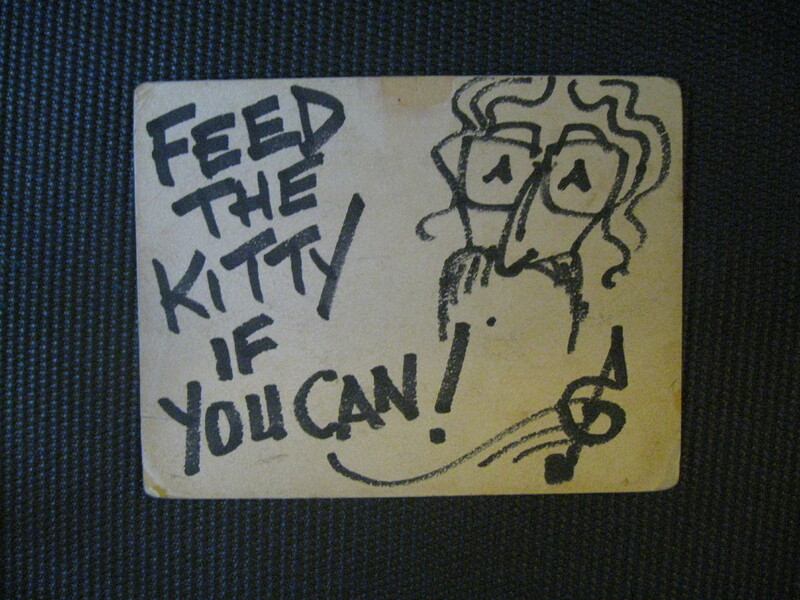 The patch was designed by a man of many talents: R. (for Robert) Crumb; or at least, it was based on his work. Mr. Crumb, the subject of a well-known documentary film, has been written about extensively. — An interesting guy. 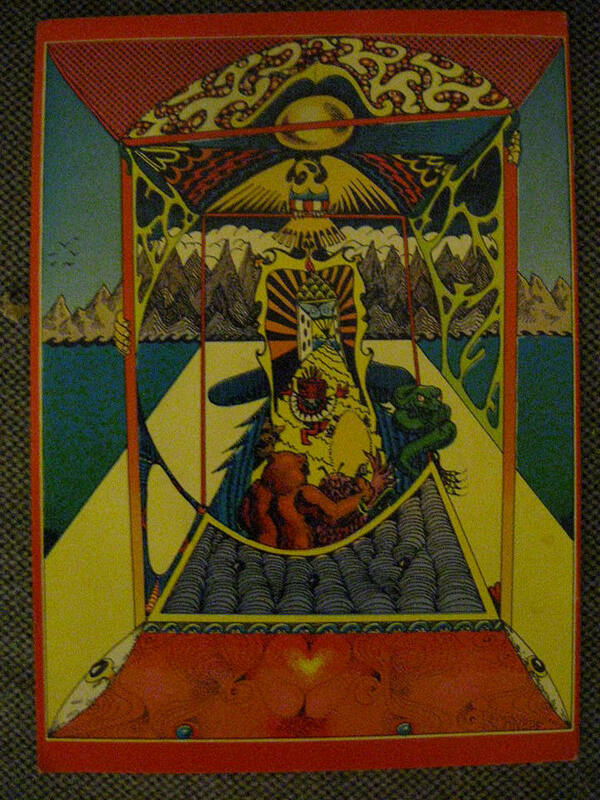 Hippies liked old things from the 20’s and 30’s; much of R. Crumb’s art paid homage to that era. 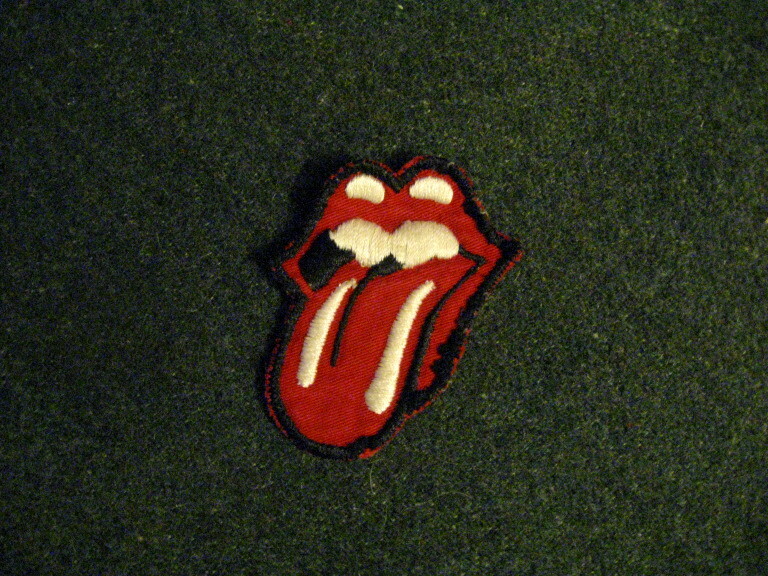 My mom sewed this early, most-likely first edition Rolling Stones logo patch, designed by Royal College of Art student, John Pasche, onto my baby blue cords in late 1971. I sported it all over our small, Eastern Washington town. If you search for this image on the interweb, you’ll readily see that this is an early release. I’ve saved it all these years. Being much more of a Beatles fan, I didn’t know what for, until now. — I needed it for this story! This is chronologically out of order; but I wanted to keep all of my apparel together, above. 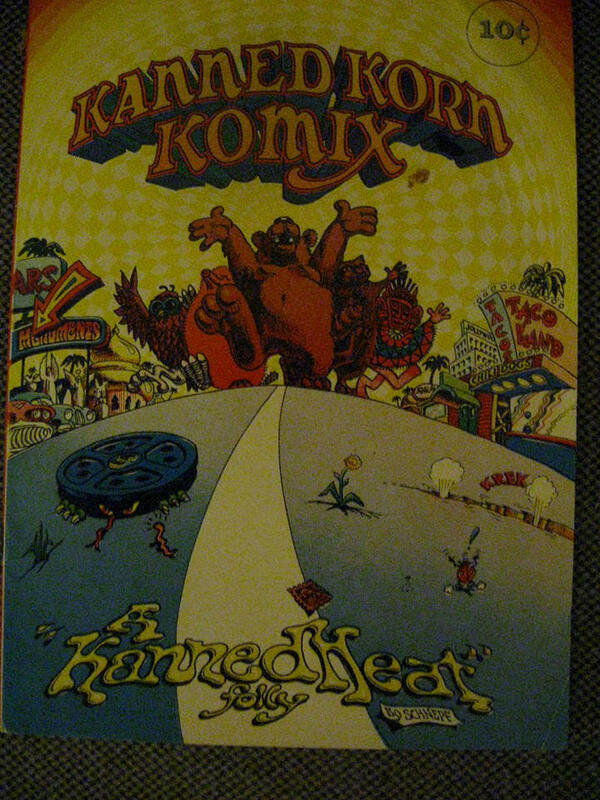 This is my one and only comic or in this case, “komix”, from the day. I saved it because it pays tribute to my all-time favorite hippie band, the legendary Canned Heat. Canned Heat was/is a Los Angeles, California electric blues band. The band’s best work focused on electrified delta blues. The guys could play Chicago blues with the best of them, and definitely, their own brand of psychedelic blues. But their electric delta blues efforts remain unmatched to this day, in my view. 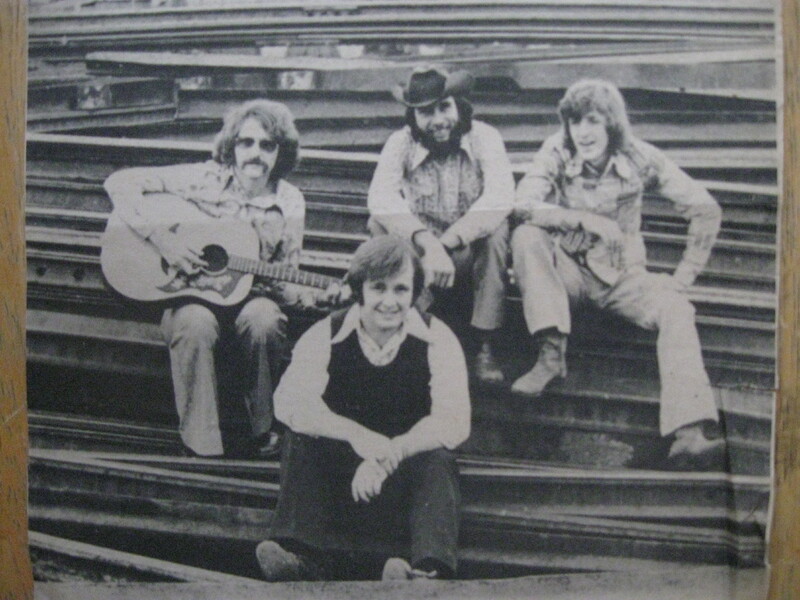 The comic came as a bonus insert with their Future Blues LP, which was released in 1970. I purchased my copy that year, at Yakima’s Bon Marche, and I still have it. I’ve seen the comic, alone, listed for sale for as high as $60, plus shipping, on E-Bay, for one in very good condition. But I’ve seen it listed for much less. I kept mine because I love it, not as an “investment”. Hey kids! Start your own collection! You can find examples of these artifacts all over the internet, and you can purchase your own. Or make me an outstanding offer. Hee hee. Is it cold out? I didn’t notice! 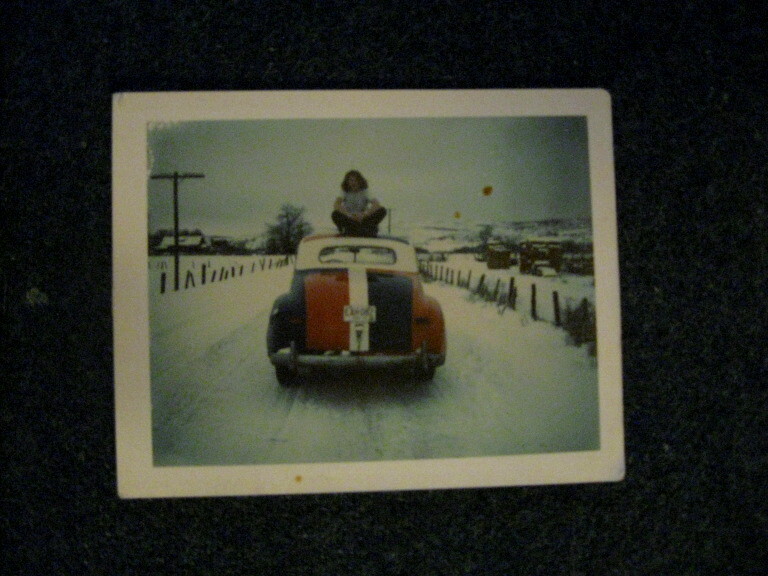 Your humble scribe in 1968, a few miles north of Yakima, perched contentedly on the roof of Chris Baker’s old jalopy. And yes, it was cold. — Yakima cold, as I call it. But I was stoned on weed, so I didn’t really care. On this snowy, frigid afternoon, we were on our way to watch the wild elk get fed, an event which took place outside of town, every winter. Chris and I painted his car with “official” Standard Oil Chevron Filling Station red, white and blue paint — the paint they used to paint their stations. We hand-painted it with brushes, in the garage of Tom Baker Chevron in Yakima. Later, my brother Al III purchased the car from Chris, cut off its top, and drove it around Yakima! Wearing my peace symbol, flashing the peace sign, at Seattle Hempfest 2018. With “SeattleFreeze”. Photo by Michael Macdonald. 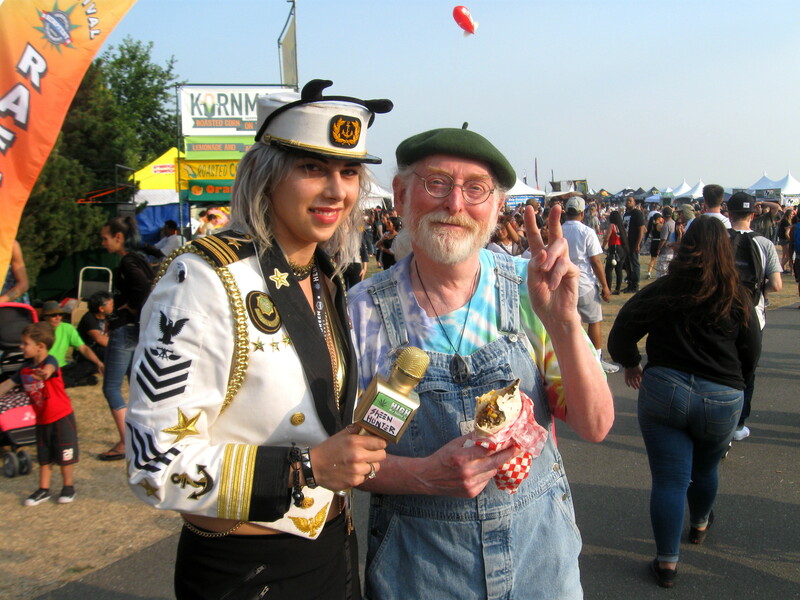 I wore my peace symbol on Saturday, August 18, along with a couple other iconic items I’ve managed to acquire over the years: my 1995 Dr. Seuss “Lorax” tye-die, and my Lee Riveted Dungarees overalls, which my late, beloved ex-wife gifted me around 1997. If I hang onto the shirt and overalls long enough, they’ll also become “artifacts of a small-town hippie boy”. Except, now I live in Seattle, where we have huge, amazing, free festivals, like Hempfest. In the above photo, I’m with my friend/favorite human being, Sheen “SeattleFreeze” Hunter, who also puts a lot of thought into what she wears. And yes, if you look right above my veggie burrito, there’s the peace symbol. BTW, I was at Hempfest, to see the legendary Climax Blues Band. I’ve only seen two blues bands at that park (Myrtle Edwards Park): Climax, who were great, and…. Canned Heat. 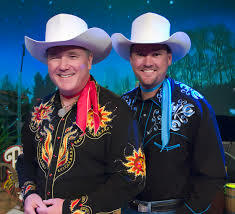 I saw them in 1994, on the 4th of July — another free concert! Life is good. 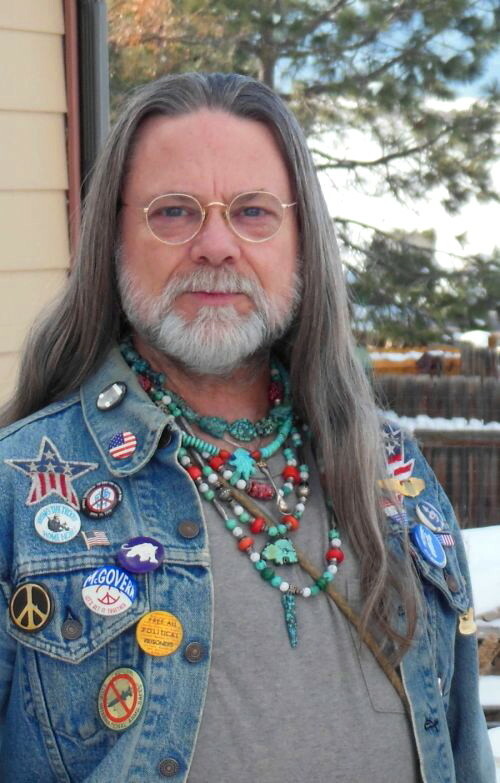 Charles of Colorado definitely likes his patches and buttons. Note: In order to preserve them for future generations, I sold my Keep On Truckin’ and Rolling Stones Tongue patches to an old hippie (I mean that as a compliment) in Colorado, who has youngsters that collect this type of item. 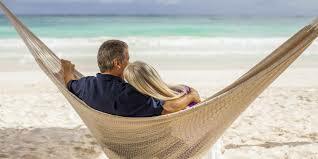 He promises to keep them into his old age, and then to pass them on to his offspring. I feel good knowing they are in Colorado with a cool family. They could have ended up in the trash heap, along with all of that other great stuff I thoughtlessly discarded. As part of the deal, I threw in a 1970, Jesus Gives Real Peace pin-back button I discovered I still had. (I found two, so I even have one of those!) And I gave the Canned Heat Comix to my great young friend in Hungary, Péter Garami, who will assure that it lives on for a good while longer. 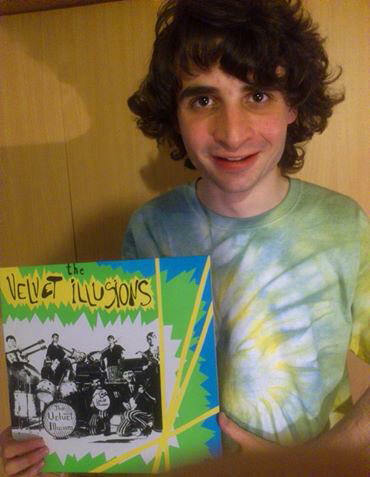 Peter, displaying his own “future artifact”, a copy of the Velvet Illusions LP my very own Yakima band released in 2016. Everything’s connected. 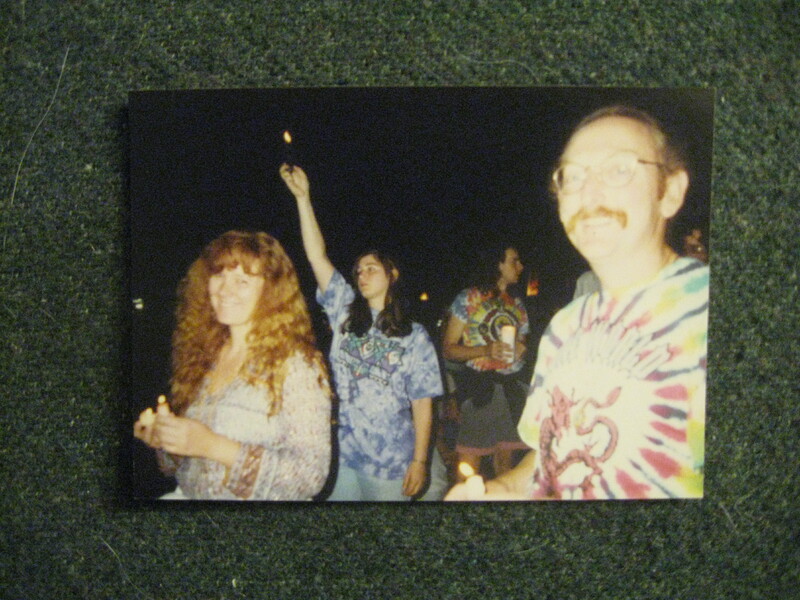 On August 9, 1995, the day Jerry Garcia passed away, impromptu gatherings took place all over the world. As word of the passing of the great genius behind “our band” spread, people just naturally came together, to mourn, and to pay tribute. 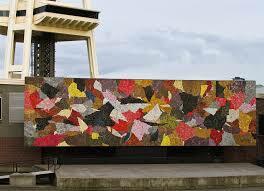 The beautiful, recently restored, Horiuchi Mural, created for the 1961 Seattle World’s Fair. There were newspaper photographers in attendance, who were taking pictures of those of us who were gathered together. I approached one, and said, “Look up! 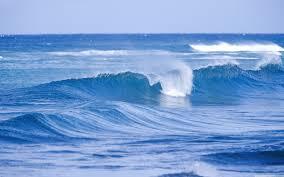 Take a picture of that!”. He didn’t. Well, I did. Here it is. Jerry was smiling. The author in his tie-dye, with other good folks. We made friends with the sweet young woman on my right. There was a good-sized crowd. I love Christmas; and I enthusiastically collect manager scenes. I received my first one in 1952 from my parents, Al and Jeannie, when I was three years old. 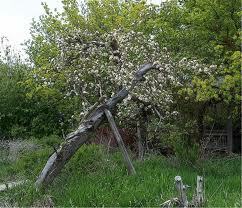 We were living in the parsonage of an old country church in Lower Naches, Washington. The photo above was taken this year. 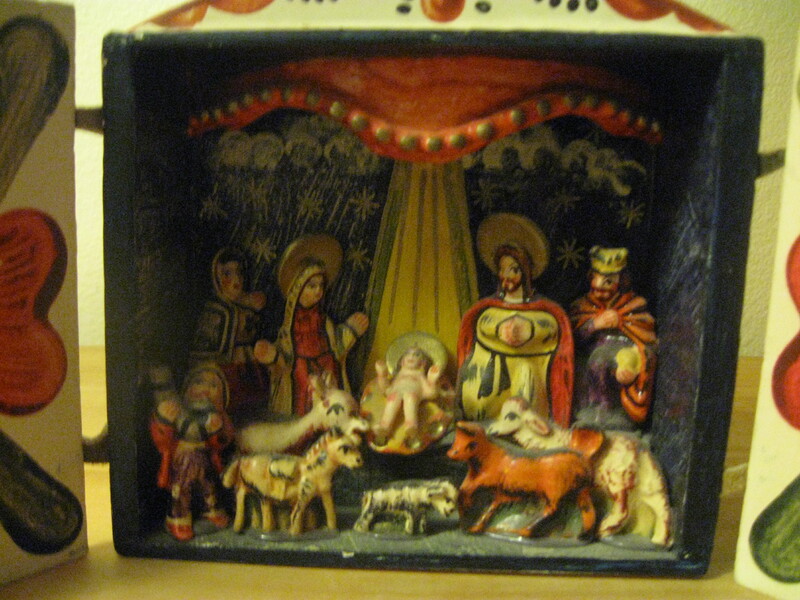 Yes, I still have this ancient manger, which was made from cardboard, lithographed paper and painted chalk figures. I’ve treasured it for nearly my entire life, so you can be sure I take good care of it. 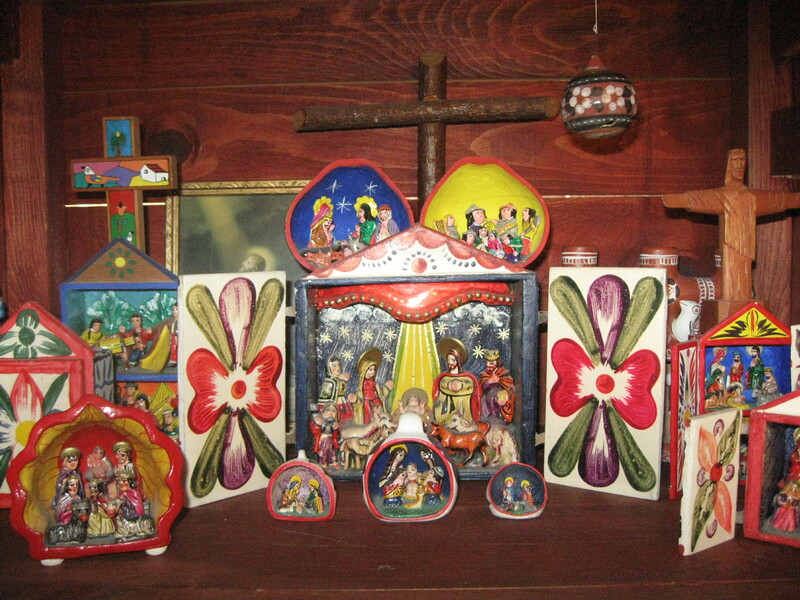 In addition to my American-made manger, I collect folk-art mangers, or retablos, which are imported chiefly from Peru and Mexico. 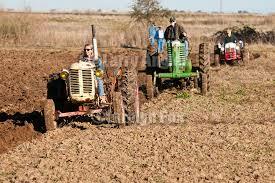 Some are made from wood, some from clay, some from gourds. Some are even created from match boxes. The Nativity figures are often made of clay; however, artisans may use a mixture of potato flour and water to form the scene’s figures. They may also use papier mache. Shown above is my permanent display of Peruvian/Mexican retablos and accessory figures, including an El Salvadoran enameled cross and a carved model of the Christ of the Andes. This is constantly on view in a rustic cabinet in my living room. I could never bring myself to closet this display eleven months out of the year! Here is the piece de resistance of my collection: my largest, most ornate Peruvian retablo. I purchased it new, approximately 25 years ago. 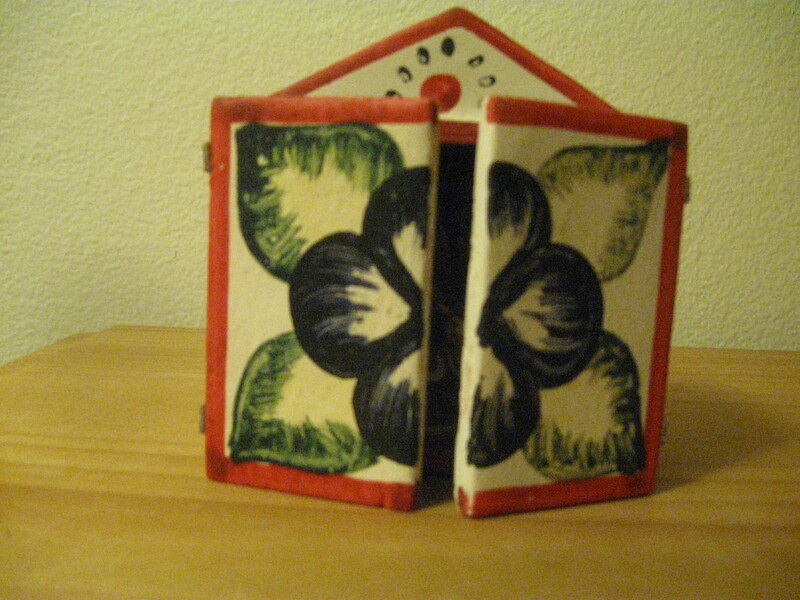 It is made of painted wood, clay or papier mache figures, and it is held together with small leather hinges. It portrays an almost-celestial scene; one which I find spiritual and inspirational. The quality of craftmanship is quite high. Newer retablos are not always as well-made. This little scene is indeed made from a matchbox. I purchased it, and most of my Peruvian collection from the now-defunct import store, Seattle, Washington’s Trident Imports. Sadly, the store closed its doors in 1997, following the passing of its proprietor. I had made a practice of visiting the huge emporium the day after Christmas, when I was able to pick up these great little displays at half-price. That is how I built my collection. At Christmastime, I hang this little treasure on my tree. 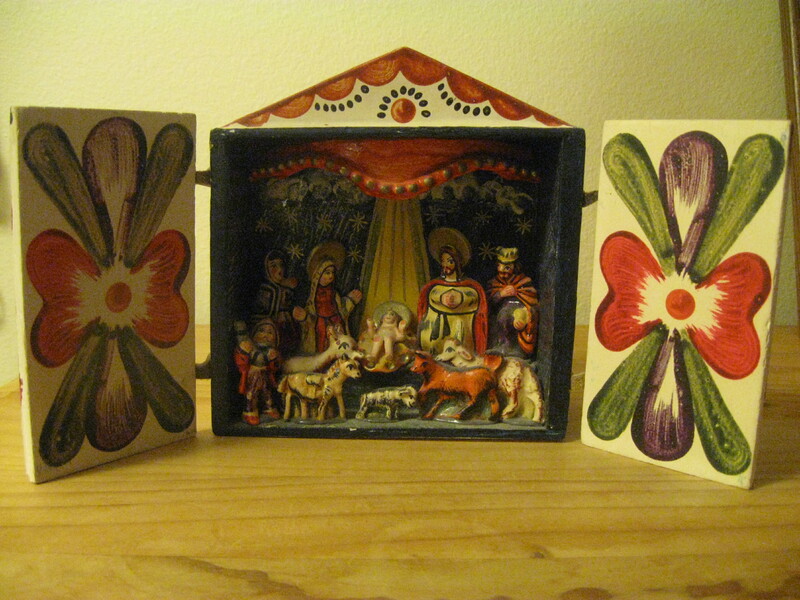 These three small retablos or dioramas are made from painted clay. 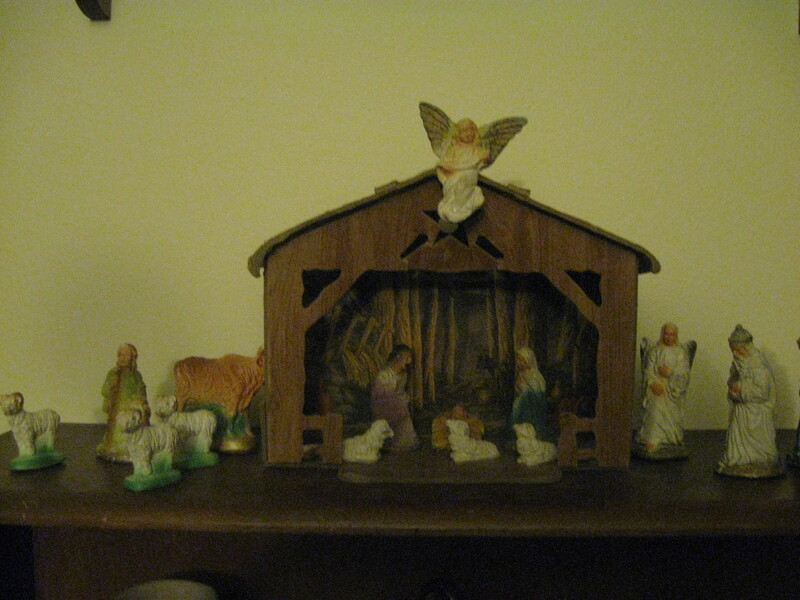 They feature simple Nativity figures in their interiors. 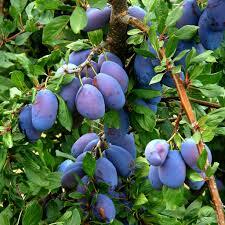 These also hang from my tree at Christmas. 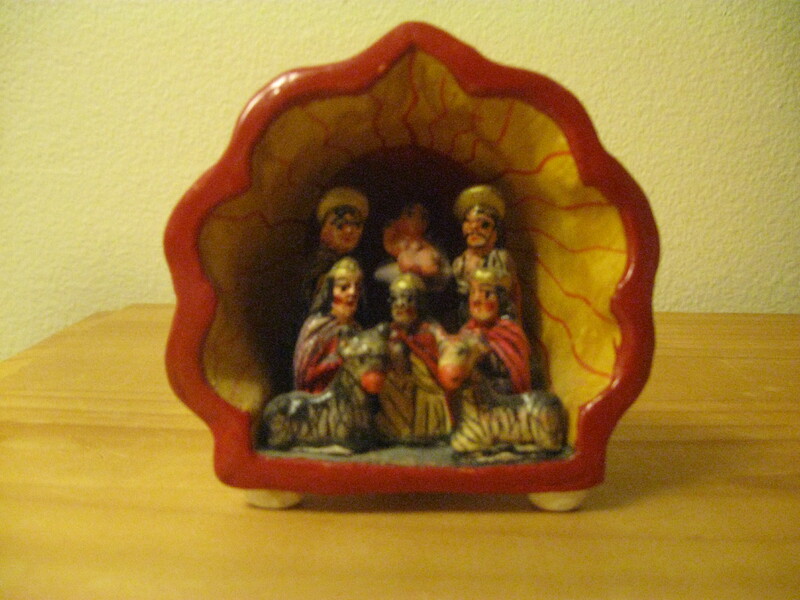 For variety’s sake, I am inserting this Peruvian candelabrum-style creche here. It is rather primitively constructed from heavy, painted clay. While the little figures of Joseph, Mary and Jesus, as well as the animals and birds, were most likely formed by hand, the candelabrum itself appears to have been formed in a mold. This differentiates it immediately from an artisan-crafted piece. It’s simply an average set. However, it is charming, and prettily-painted. I purchased it around 1995. For its type, that makes it a newer piece, actually. And that helps explain why it was chiefly made in a mold, in a rather hurried manner. 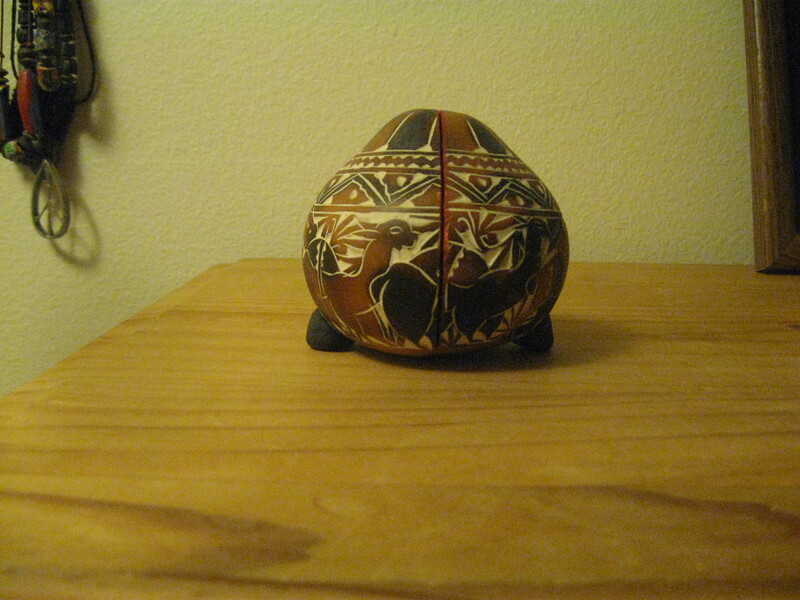 Gourds are often incorporated by Peruvian creche makers. 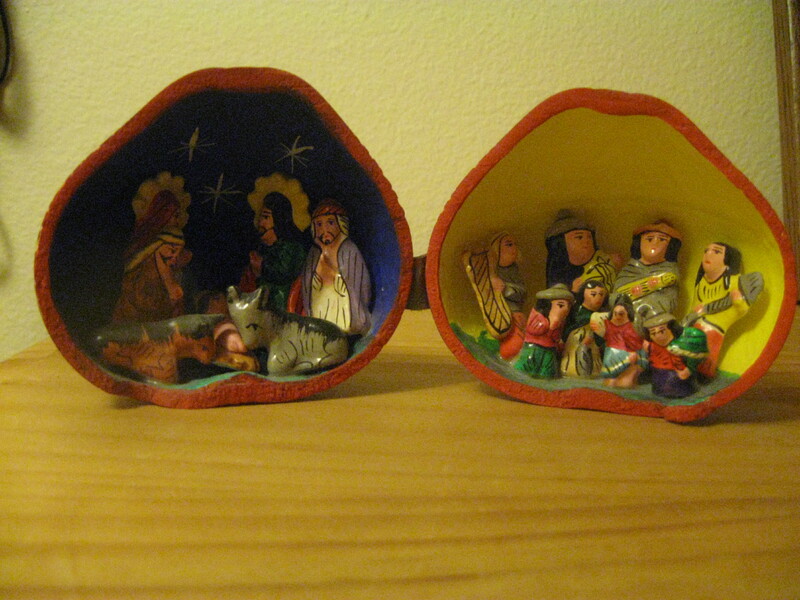 In creations such as these, the Nativity scene is often paired with a scene depicting traditional Peruvian musicians. To create these, the artist carves the gourd’s outside, then cuts it in half, hollows it out, paints the interior, and inserts figures made of clay/potato paste/papier mache. 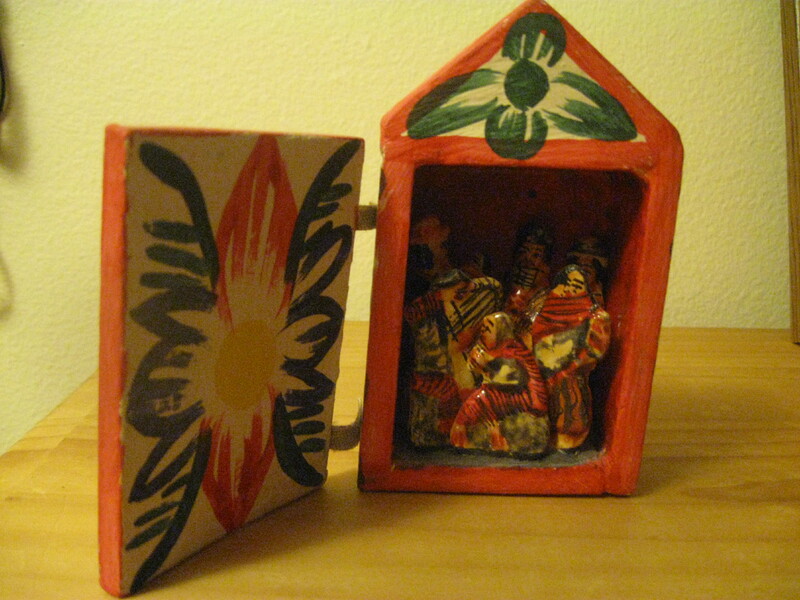 Peruvian gourd diorama/retablo carved exterior. 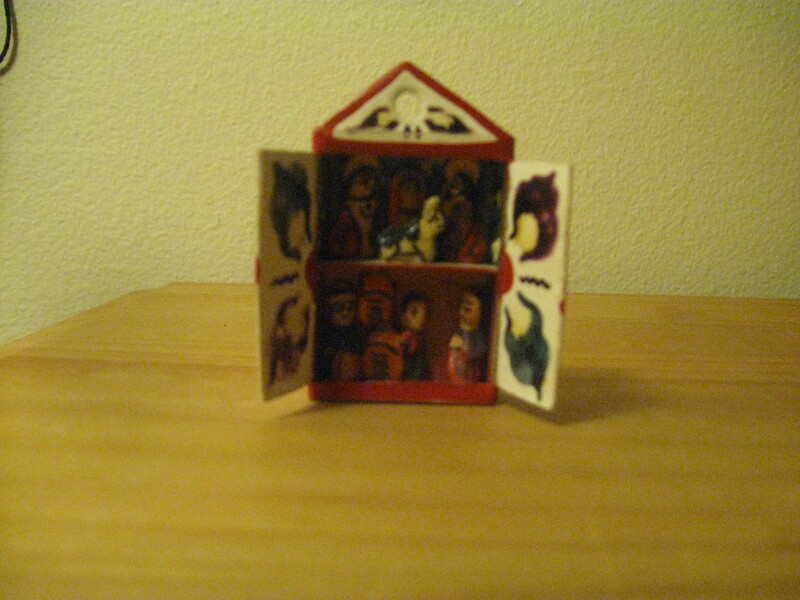 Here is a similar retablo; however, it is made of clay which has been formed and painted to represent a seashell. 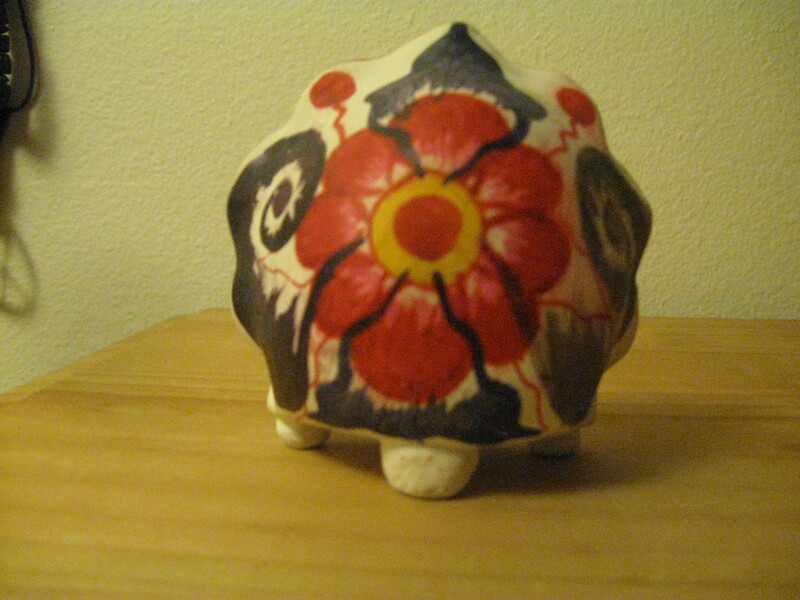 Below is the reverse side, which has been beautifully painted. 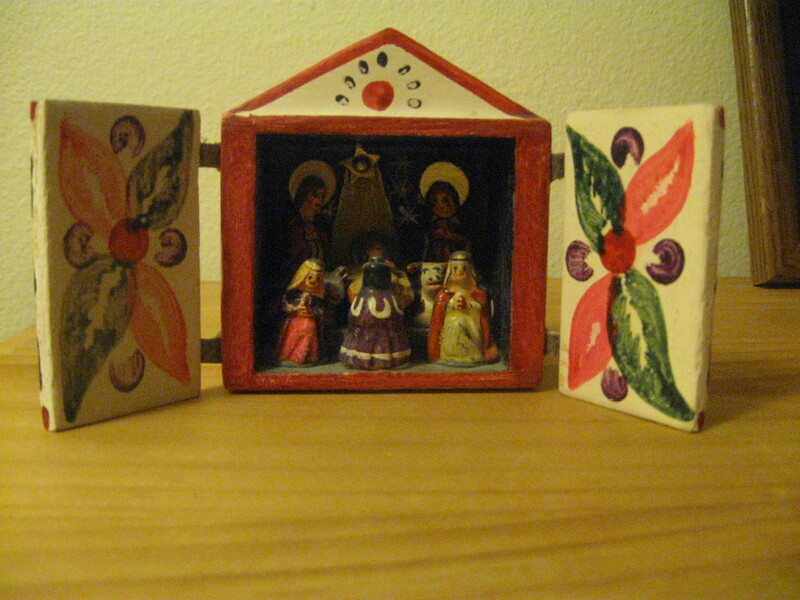 Here is a small, doored Retablo, one which again pairs a Nativity scene with a scene featuring musicians. The painting here is especially fine. Above, is yet another doored Retablo. I love this style, because it is beautiful whether the doors are open, or closed, as below. 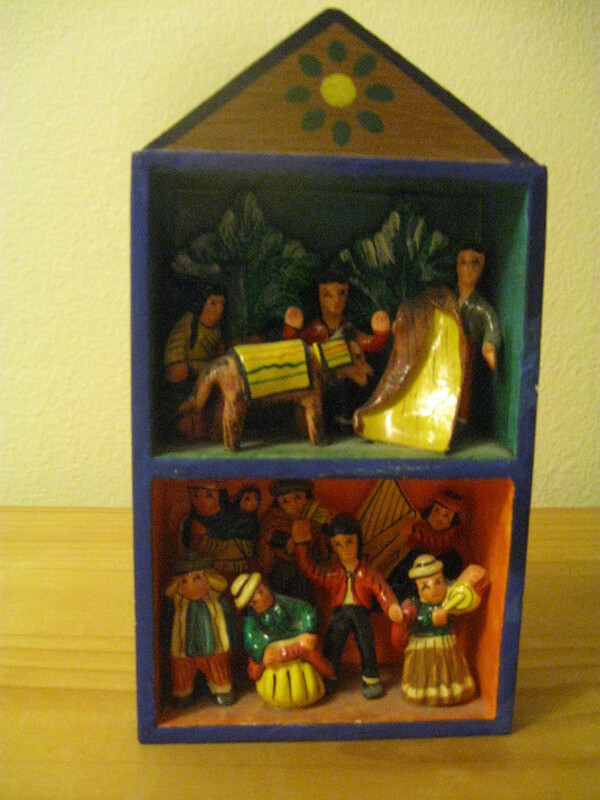 This retablo doesn’t feature a Nativity scene; however it features the traditional musicians so often found in retablos, so I group it with my Nativity display. It is unique in that it has only one door. It has a certain lop-sided look to it. Below, it is depicted with the door closed. Bamboo retablo featuring an array of scenes. This unusual retablo is made from bamboo; the figures are made from painted, dried, mashed potatoes! 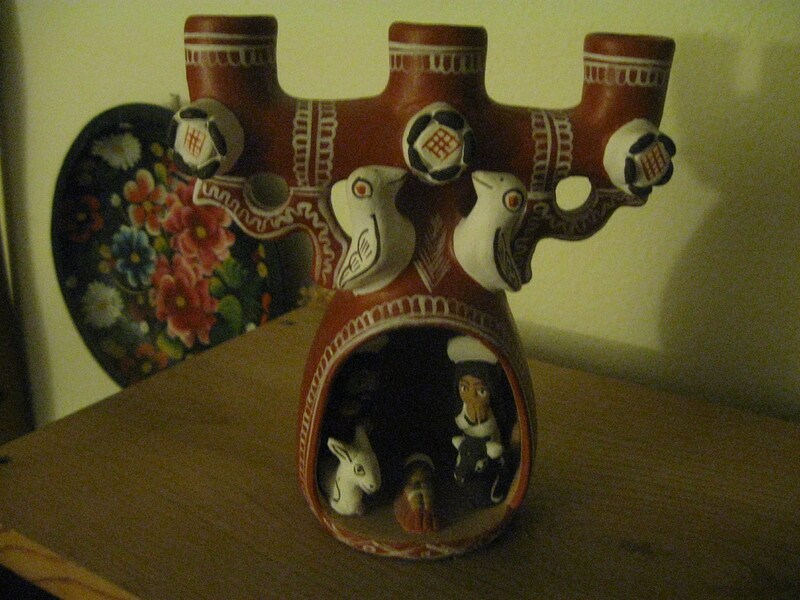 I know this, because my late wife and I bought it directly from the visiting Peruvian artist, at Sante Fe, New Mexico’s great folk art store, Jackalope. 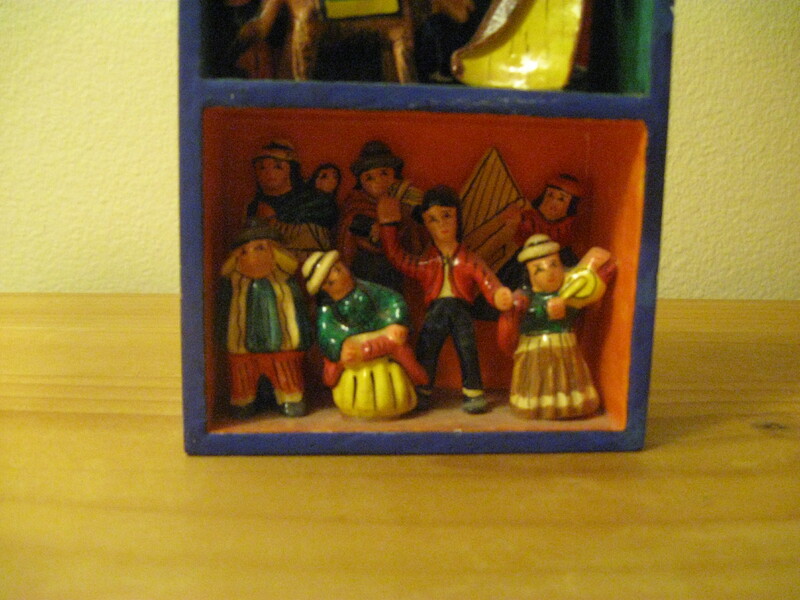 The retablo features not only a manager scene in its first section; it also features other scenes from Peruvian life and/or folklore. We picked this up on our late-80’s car trip from Seattle, WA, to New Mexico. Seeing the West and Southwest via car, staying in inexpensive, quaint little motels with kitchenettes and vintage swimming pools along the way, was unforgettable. 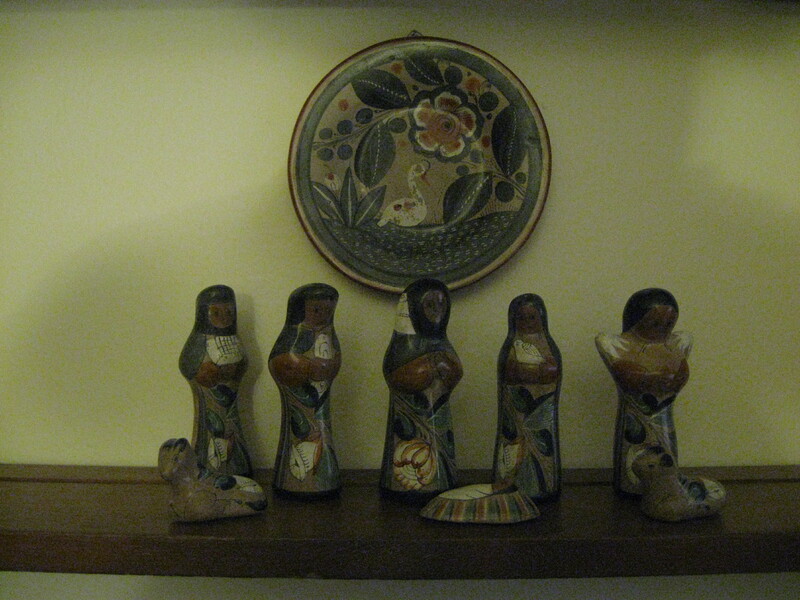 My collection includes one ceramic Nativity scene created in Tonola, Jalisco, Mexico. 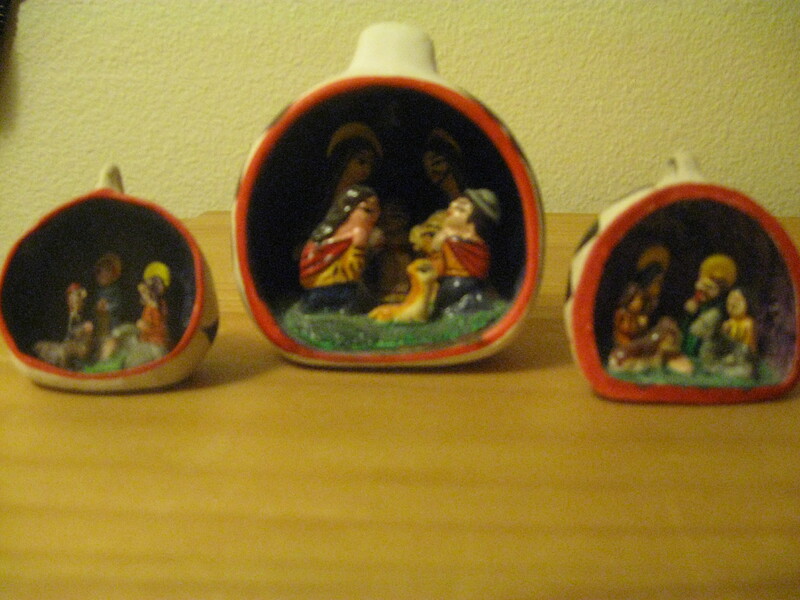 When I encountered this beautifully-decorated, used set ten years ago, I noticed it was missing one of the magi, and perhaps an angel. But it is the only example I’ve ever found, so I acquired it. I display it year-round, in my living room. This retablo depicts a Peruvian hat seller. The iconic hats of Peru can be seen, offered for sale. This piece is perhaps 25 years old. I purchased it used, so cannot date it exactly. I bought it at the old Westlake Antique Mall, from my friend, manager Bill “Blenko Bill” Agle. 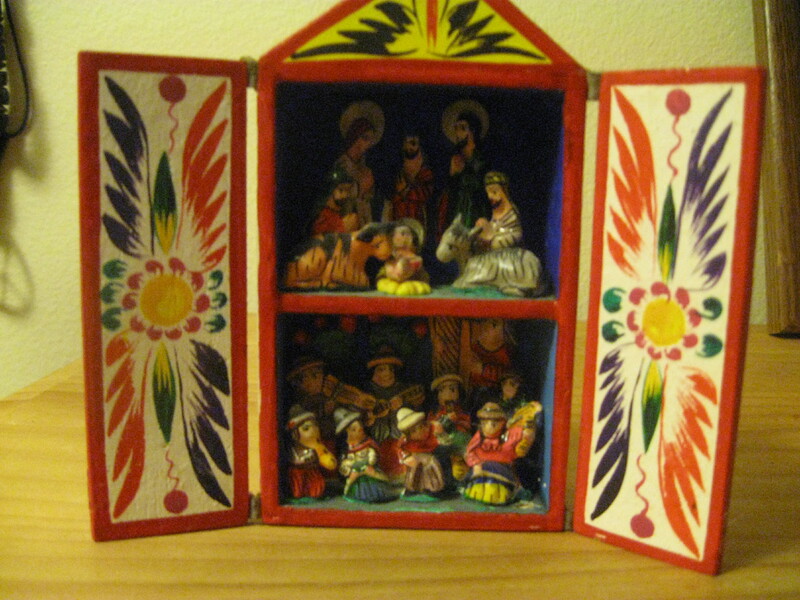 This retablo, which I purchased twenty years ago at the wonderful Jackalope in Sante Fe, New Mexico, is somewhat different from the others in my collection. 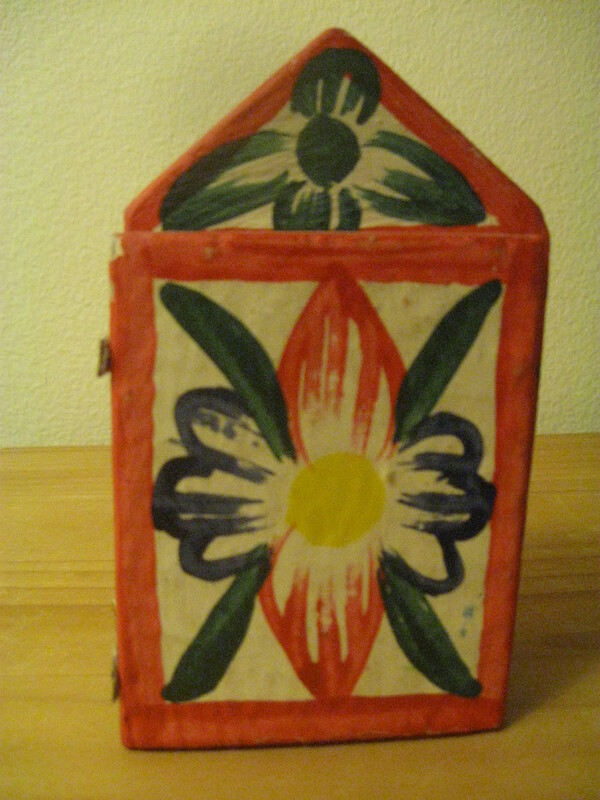 It is only partially painted, so that the wood it is constructed from can be seen. Plus, it has no doors. Not only that, but: is that Elvis? It looks like Elvis! I find it humorous that, when not depicting the Nativity scene, the artist has chosen to depict another King: the King of Rock and Roll! 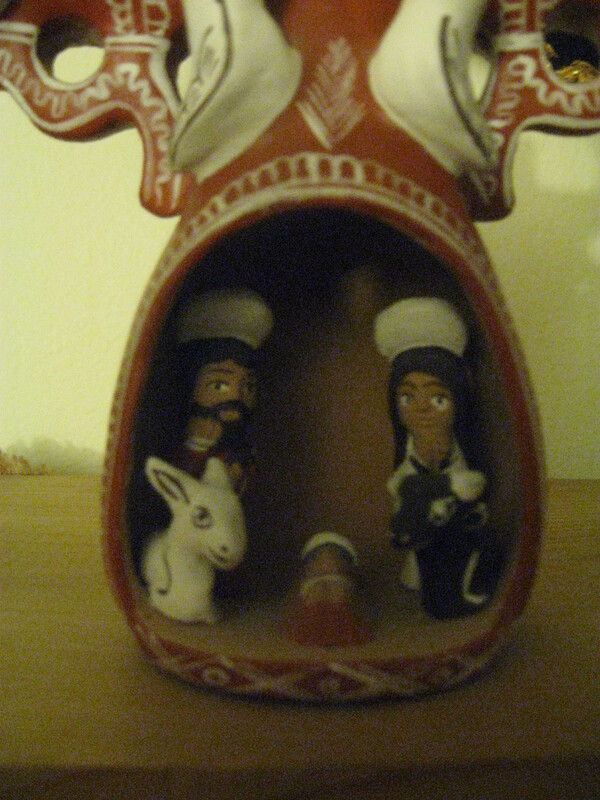 I am always on the lookout for traditional depictions of the Nativity. 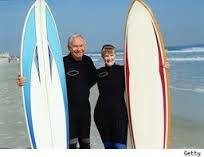 I am looking for those with some age on them, as the quality of crafting is usually higher. I’m not enamored with “traditional” art which is partially pre-made via the use of molded products. 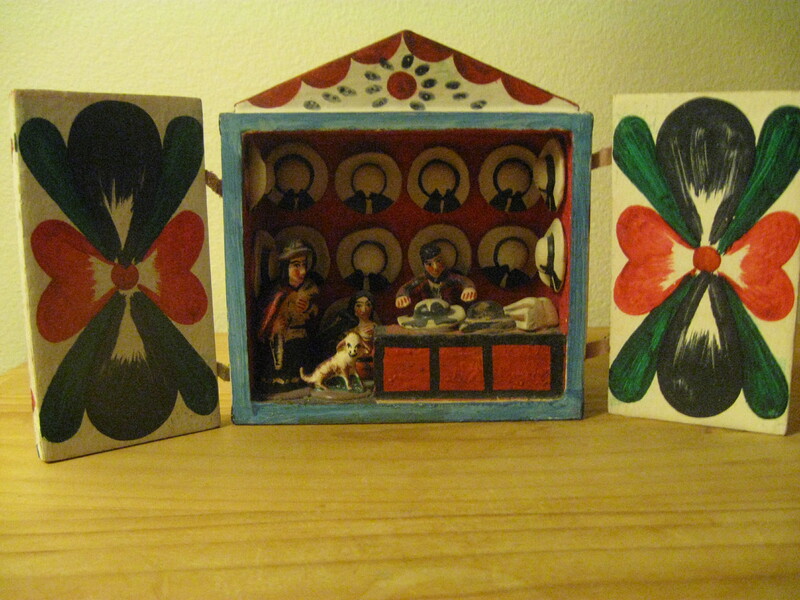 I love the fact that extra care and effort has been used in the creation of the retablos in my collection. And I love that they are dedicated to the celebration of my favorite holiday! What’s Better Than Playing A Folk Festival On Bob Dylan’s Birthday? Not a lot! The author with his beloved 12-string. 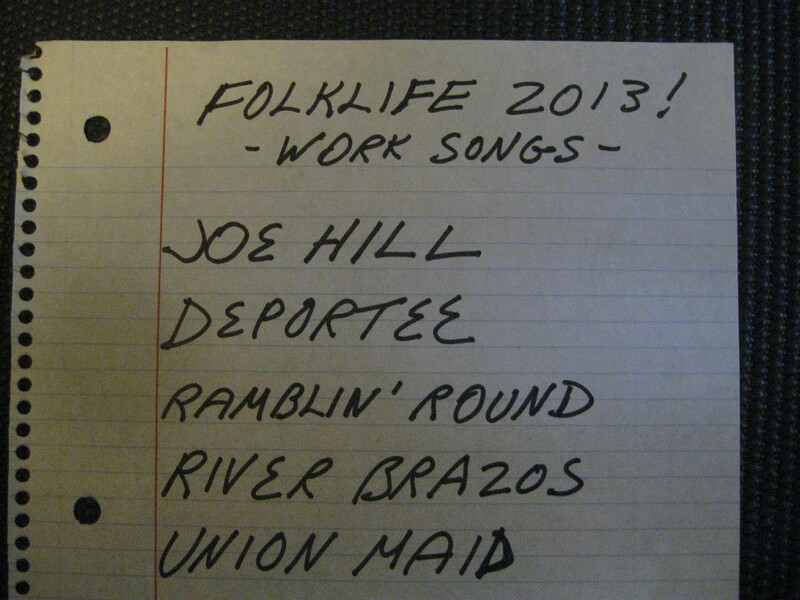 I awoke Friday, May 24, 2013, not quite prepared to play my first Northwest Regional Folklife Festival in 19 years. What was the problem? – Well, I wasn’t sure what songs I wanted to play for my concert. Since I’d let 19 years transpire between appearances at such a big event as “Folklife”, I wanted to give the best possible show. I wanted to bring the “world’s best set-list”. For weeks I agonized over what to play. I finally found it easier to jot down four set lists, each one having a theme. I figured I would pick one right before I did my show, depending upon my mood, or upon the makeup of the audience. — You know, after performing for 51 years, I like to think I can determine what an audience wants! I excitedly got dressed-up and ready to go, garbed in my finest “folksinger denim”. I called a cab, took it to Seattle Center (all the while, extolling the virtues of the Festival to the driver, who sadly, had never heard of it). I arrived at my venue, The Folklife Café, in McCaw Hall, accompanied by the requisite butterflies inhabiting my stomach. I checked in, and waited for my time in the spotlight. 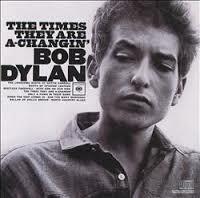 I started with The Times They Are A-Changin’, a song which doesn’t require the performer to be in a good mood. By the time I had wrung all of the emotion and meaning out of that song, I forgot all about the confusion, about the late start, and I found the proper groove and state of mind to play the first request. A member of the audience called out for Tomorrow Is A Long Time. Before I started the song, I thought of, and mentioned, how the young group, Nickel Creek, did a great version of that very romantic song. I envisioned Sara Watkins’ beautiful delivery, and I tried to “sing it pretty” myself. When I had sung that song, a listener asked for Sad-Eyed Lady Of The Lowlands, which just happens to be one of my all-time favorite Dylan songs. I probably took eight or nine minutes to get through that number. It’s a down-tempo song, comprised of about a million verses. By the way, I have no idea what its lyrics mean! But it’s a great song; I don’t need to decipher it; I just try to “nail it” every time. 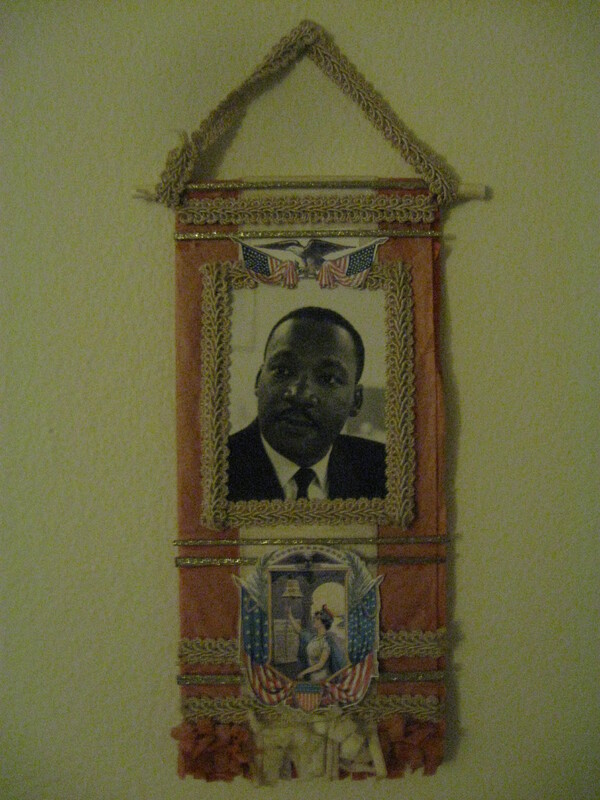 Martin Luther King Memorial, from the author’s collection. The next thing I knew, the stage manager signaled “one more song”. Someone called out “Blowin’ In The Wind”. That was so apropos, because it gave me the opportunity to mention that Peter, Paul and Mary, the great, historic, folk trio, sang that very song 50 years prior, at Dr. Martin Luther King’s “I Have A Dream Speech”, at the March On Washington. I put everything I had left in my 64-year-old body into my performance of that classic, and that was it. That was my show. But! I found out later that two great friends of mine, sisters Kyle and Evan, were in the house, and they had surreptitiously filmed me doing Blowin’ In The Wind. They were kind enough to load it onto YouTube. And here it is, for your enjoyment. Thank you for allowing me to relive the memory of one of the most satisfying shows I’ve ever given, in my 51 years of performing. Enjoy the song. If you haven’t had enough, well, I have one more present: here is a younger, less-hairy version of myself, doing The Times They Are A-Changing, on a very cold November morning, at Seattle Occupy. Sketcho Mutcho Busker’s Sign, Or My Street Singer Sign Was Made By A Famous Artist! 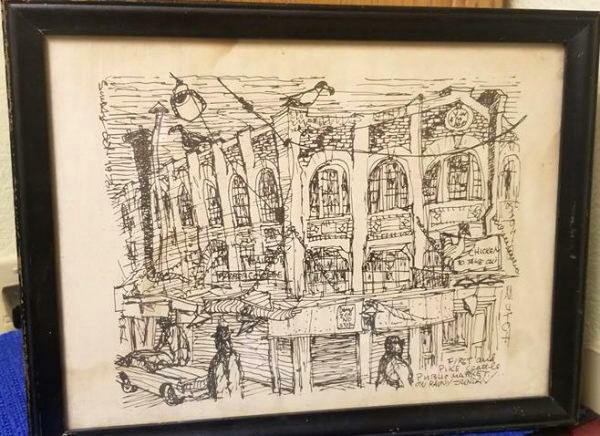 Here is a little piece of Seattle, Washington history: I’ve busked (played on the street) and played at many basket houses (where you are paid via audience tips) throughout my musical career. I’ve been using this sign to solicit tips for more than forty years. 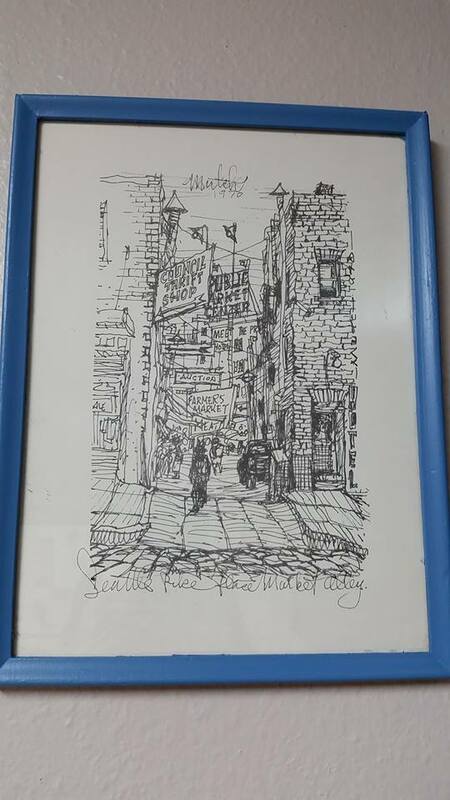 Will Mutch, aka Sketcho Mutcho, the great Pike Place Market artist and sign painter, created it for me in the winter of 1974. 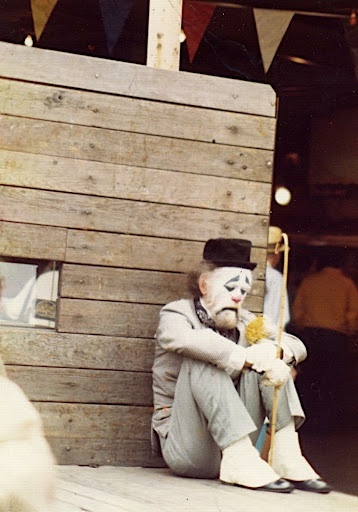 Will Mutch, aka Sketcho Mutcho, circa late 1970’s. I also happen to have the very first Pike Place Public Market Musician Permit ever sold. A regulation was put into effect which required buskers to obtain permits to play in the market. My singing and guitar-playing act was pretty well-liked. When I went to the office in January 1976, to buy my permit, the market representative pulled out button #1, and said, “We saved this for you, Randy”. 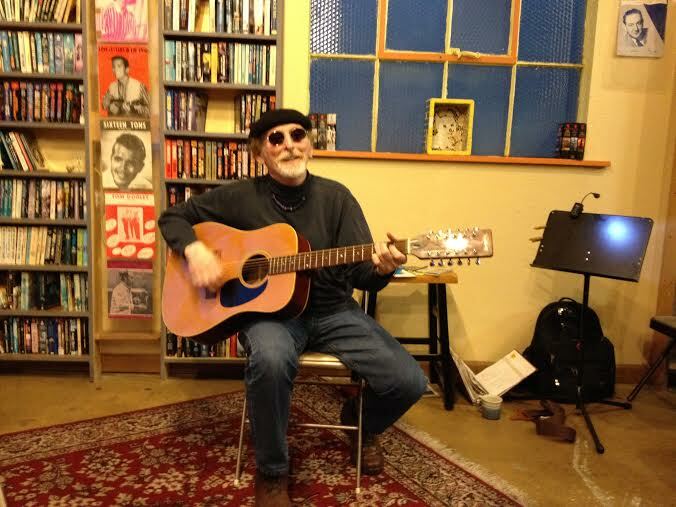 The author performing at Couth Buzzard Books/Cafe, June 2014. 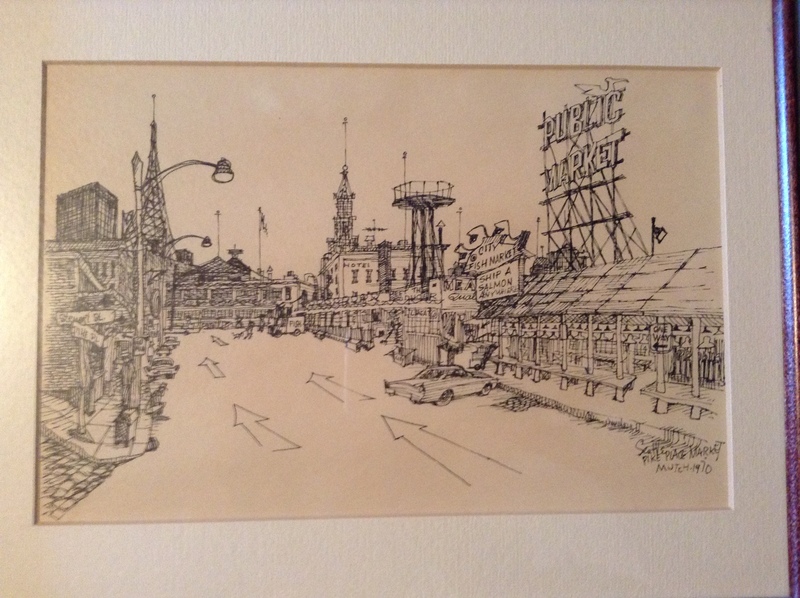 Reader Tiffany Doody was kind enough to email me photos of two prints of Sketcho’s work. You can get a fairly good idea of the artist’s style. He used a lot more strokes of the pen on these, compared to my simple little sign. And, in June, 2016, I heard from a person who aptly described herself as a lucky art lover and bargain hunter from Port Orchard, WA. 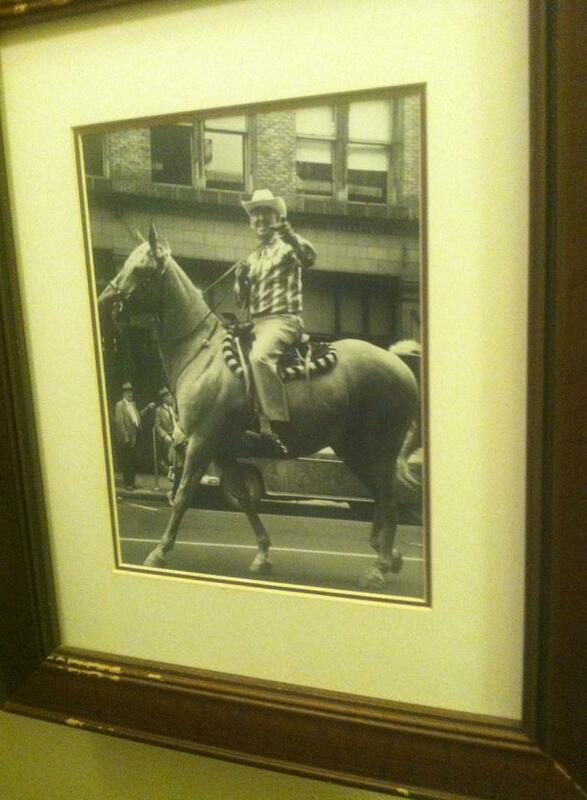 She sent me a photo of this print from 1970. She was fortunate to find it at an incredibly good price. I love it. It shows the Market from Stewart Street, looking south. I really appreciate her sharing! 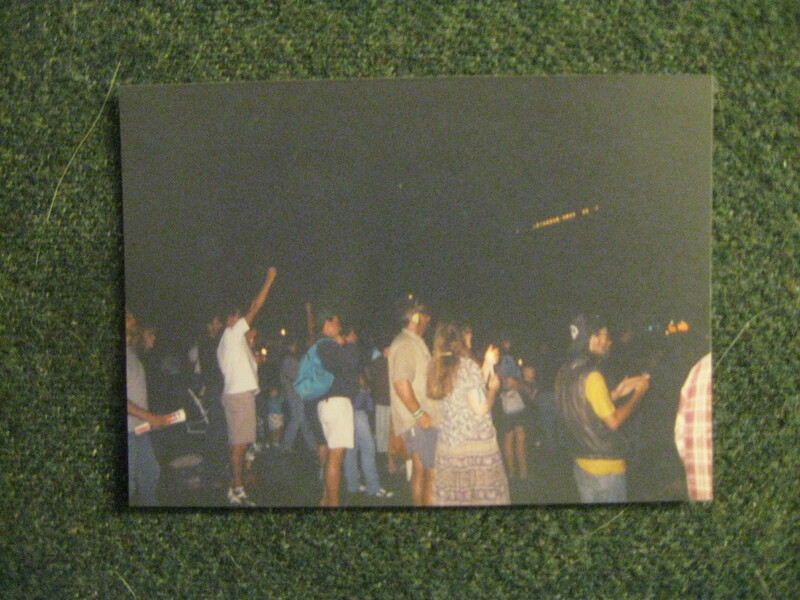 I’ve played music many times on the street corner portrayed in the lower left section of the photo. Corner Market Building at First and Pike. More blessings: in August 2018, a young man named Corey Alba contacted me to share a photo of a print his grandparents gave him to commemorate his graduation from college. (Perhaps they visited here, long ago?) Sketcho would have made this in the late 1960’s to early 1970’s (I’d say 70’s, judging by the car in the sketch). It features the beautiful, old Corner Market Building at Pike Place Market, here in Seattle. Not old as in gone! Old as in built as the keystone of the block in 1912, and still standing. As recently as 2013, I’ve spent many an hour singing for tips in front of Left Bank Books, the long-time radical bookstore nestled in the Corner Market. In this image, Sketcho shows the Market on a “rainy Sunday”, when the big, accordion-style metal doors of the various businesses were not rolled up. Because back in the day, the Market was closed on Sunday. If you have an example of Sketcho’s work (more like play!) please contact me. Leave a comment here; or message me at my Facebook page, “Randy Bowles, Folksinger/Storyteller/Photographer”. I’d love to share an image of it here. My blog stories are meant to be dynamic. I add to them all the time! Let’s close with one more photo, above: Will (Sketcho) was fond of donning white-face and strolling around the market, saying hello to all. He cut quite a figure. I loved him. I last saw him in the early-mid 1980’s, at the Moore Theater. The Moore had just been restored. It was a beautiful theater. It still stands! Will has passed on; I don’t have any details…. Just great memories. Will someone please tell Anthony Apsay I’m blogging about him? 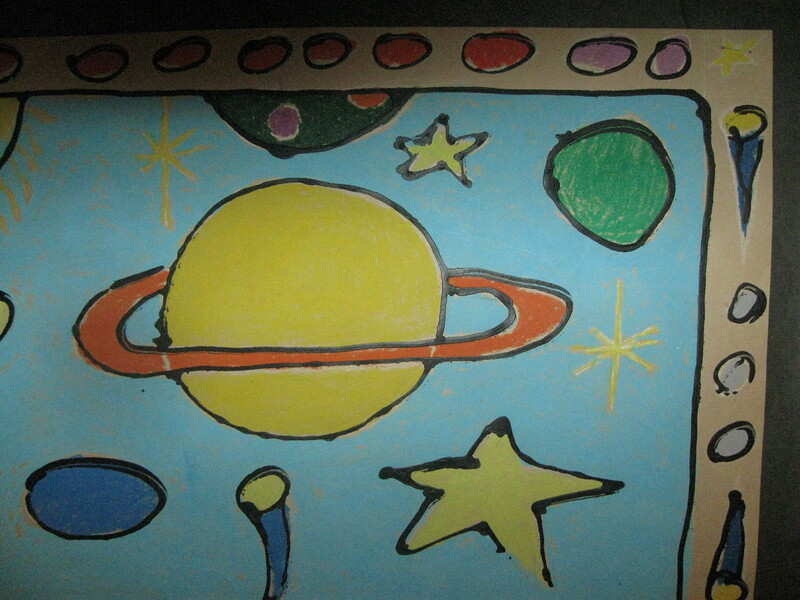 How does the cosmos appear in the imagination of a nine-year-old? Anthony Apsay’s answer to this query is the striking painting pictured herein. 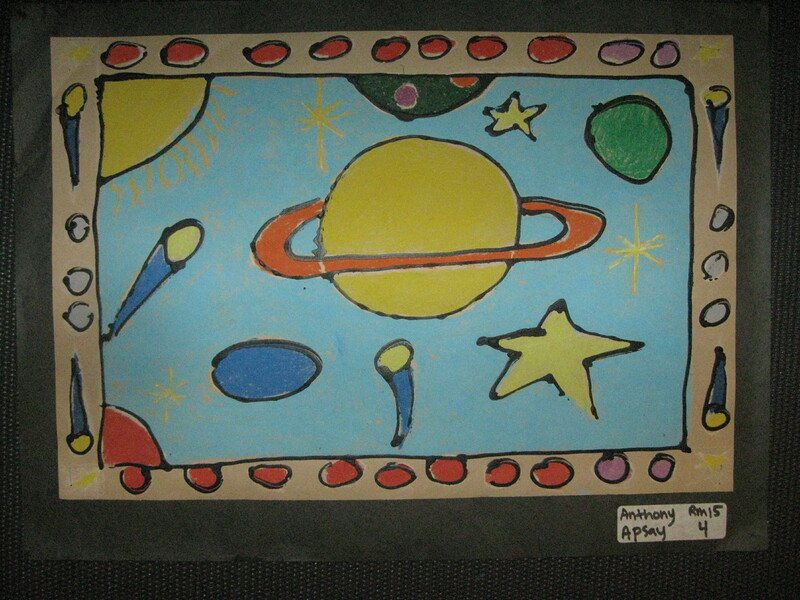 Anthony’s vision of the cosmos is a multi-colored phantasmagoria of stars, comets, suns, planets, and other heavenly objects, boldly outlined in black, and executed with confidence, imagination and skill. I was captivated by this painting upon first viewing, circa 1994. 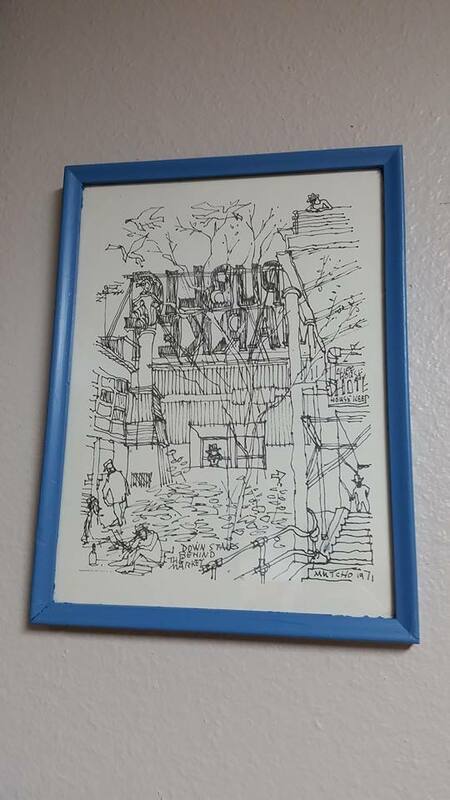 I was able to rescue it, and it has hung in my home(s) for more than twenty years. The 12” x 18” tempura painting has long added color and whimsy to my daily life, and will continue to do so. 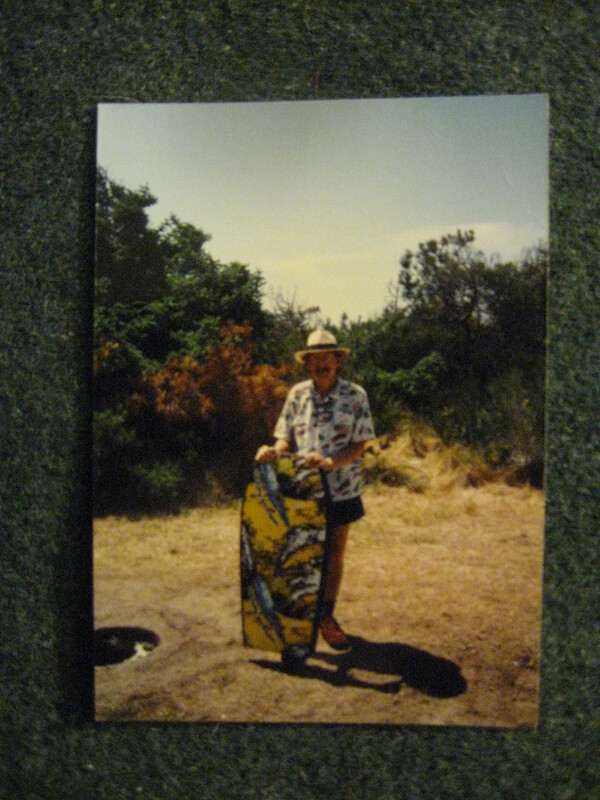 My late, former spouse, Sally Jo Davis, was for many years, a Seattle, Washington school teacher. Having earned a Masters degree in incorporating the arts in the classroom, she enjoyed having her students engage in art projects. 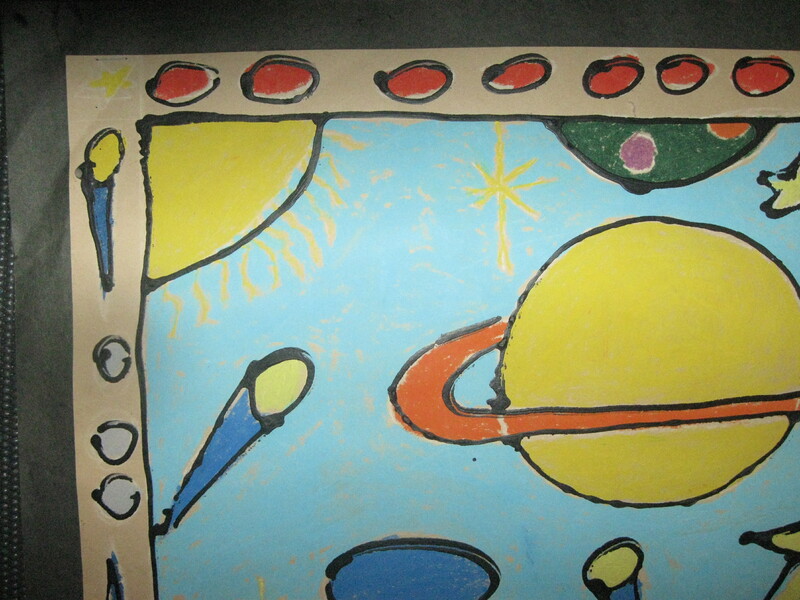 One assignment she gave her fourth grade class in 1994, was to paint the cosmos, as it appeared to them. She hung the results on the walls of her room, for students and visitors alike, to enjoy. After the art hung on the walls for perhaps a few weeks, SJ announced that any student who wanted his or her art was welcome to take it home, and many did. But not everyone…. It was my custom to help Sally Jo dismantle her classroom at the end of each school term. 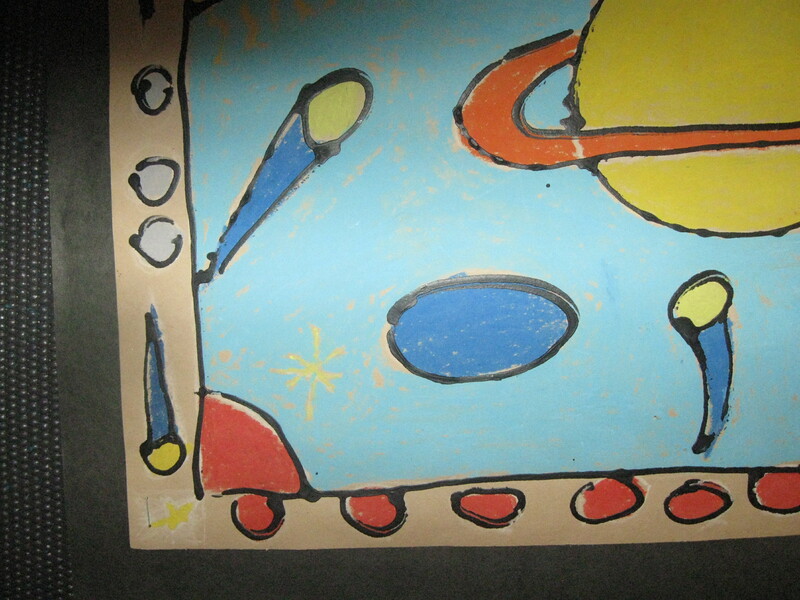 One task she gave me in early summer 1994 was to take down the art which had been left behind. This painting was included in that group. 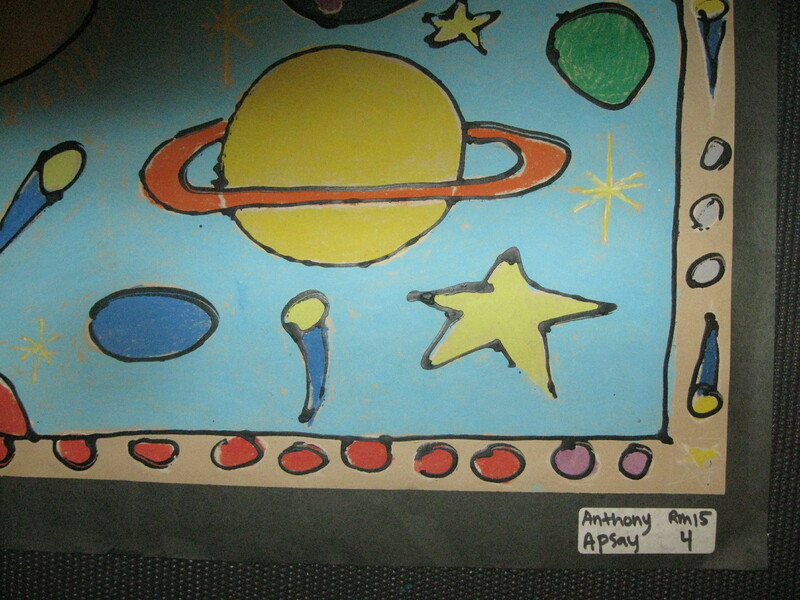 Perhaps Anthony Apsay saw something in his beautiful rendition of the cosmos that didn’t measure up to his standards, so he left it behind. I can’t imagine what that may have been. — There were at least a dozen orphaned “cosmos” paintings remaining on the walls; thus, I had quite a few from which to choose. Anthony’s jumped out at me. Being an art collector who was always on the lookout for more things of beauty, I asked SJ if I could have the painting. She said, “It’s either that or the recycling bin”. I removed it from the wall, carefully rolled it up, and took it home. I have not let it out of my sight since that day. I remember in 1957, when I was a third grader in Yakima, WA, my mother found a tempera painting of a blossoming apple orchard, which I had created at school. It was folded up and stuffed in the back pocket of my jeans. She immediately placed it on her ironing board, laid a towel over it, and ironed the creases out of it, as best she could. She framed and hung it on my bedroom wall. She then asked me to bring home any future projects in a more pristine condition. She said, “Your painting is very good! Please don’t fold-up the next one”. 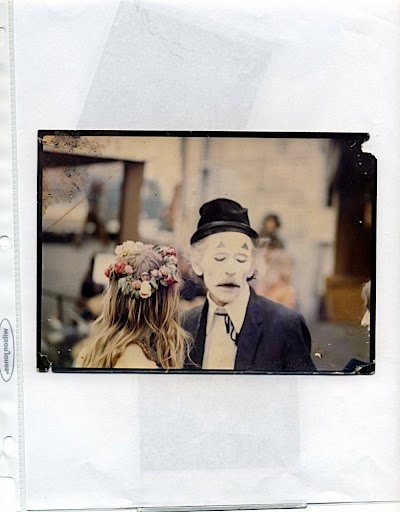 — I think as children, we may be tough critics when it comes to judging our artistic endeavors. I thought my painting was pretty bad; Mom loved it. Again, Anthony must not have cared for this artwork. But I enjoy seeing it every day. 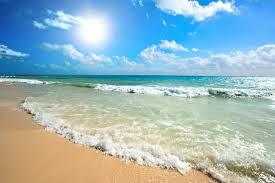 Its bright colors, fantastic heavenly objects and outright excellent execution continue to inspire and delight. By Anthony Leata, Steilacoom, WA. I recently spent a fabulous day touring and photographing the Washington State Fair, which is held at Puyallup, WA. 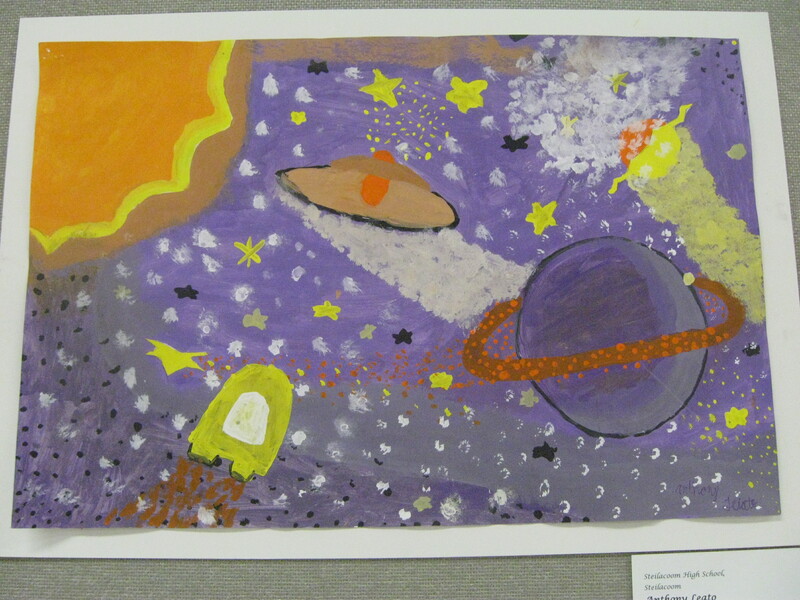 I spied this painting which was included in an exhibit of junior and senior high school art. I’m happy to see the tradition continues! While examining the work, I fantasized that perhaps a teacher whom Sally Jo mentored in the Seattle School District had his or her class do a similar project.